How many toes can a cat have on one foot? Some American Polydactyl cats have up to seven. Perhaps the most famous American Polydactyl Cats were those Ernest Hemingway wrote about, and as a result this breed is sometimes known as the Hemingway cat or mitten cat. In size, American Polydactyl cats are medium to large with bodies that are strong and muscular in appearance. Their heads are broad, with a modified stop and medium in size. Their noses and muzzles are medium sized and the chin has a squared appearance. The wide-set ears have pointy tips. Occasionally, American Polydactyl cats used for stud purposes have very well developed cheeks. The rounded eyes of American Polydactyls are set at an angle, and any color or color combination is acceptable. This is true also of coat color and fur length, so long as the hairs lie close to the body. Longhaired American Polydactyl cats should have silky smooth hair. The bodies of American Polydactyls are rectangular in shape, with good muscling over a medium bone frame. Their chests are well rounded and broad. Some American Polydactyls have bobtails, and these cats have shorter bodies than those with long tails. The legs of American Polydactyls are straight and sturdy, and bobtailed cats have hind legs that are noticeably longer than the front legs. 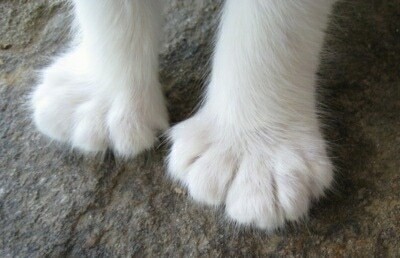 Of course, the characterizing trait of the American Polydactyl cat is its feet with extra toes. One of the conformations of the extra toes looks like a thumb, and for this reason American Polydactyl cats are also known as ”cats with thumbs.” The other conformation is that of another, three-toed foot attached to the cat's five-toed foot. 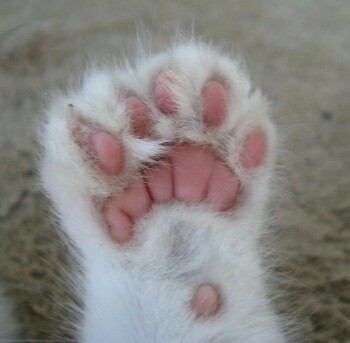 The extra toes may be found on the front feet only or on the back feet only, or all feet may have extra toes. Comes in all colors and patterns. 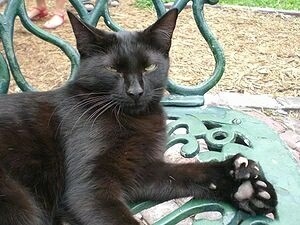 In personality and care requirements, American Polydactyl cats are much like any other cat. Many owners have made the observation, however, that their American Polydactyl cats seem to have a more relaxed and mellow personality than other cats they have owned. These cats are quite hardy and can survive even in snowy weather. American Polydactyl cats adapt very well to indoor or outdoor life, or a combination of the two. They make outgoing pets, and are reported to be affectionate and patient even toward children. American Polydactyl cats probably came to the United States on ships in the Colonial Period. They were kept by sailors who considered them to be extremely good luck when at sea. Their name, polydactyl, means multiple toes. American Polydactyl cats are actually regular house cats, but with a genetic mutation which gives them multiple toes, and sometimes a bobbed tail. Polydactyl cats may be found in any breed, but American Polydactyl cats are bred specifically for their extra toes, their temperaments, their good health, and their color or size. The most unique trait of a polydactyl cat is its extra toe. Instead of having five toes, it has six or more (thumb included). 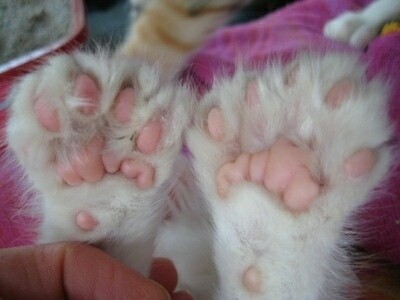 The extra toes can be on all four feet, just on the front feet, or just on the back feet. 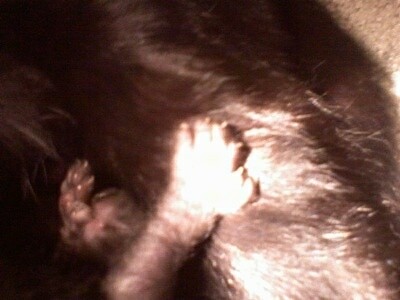 Underside of the left front paw showing extra toes of a polydactyl kitten. 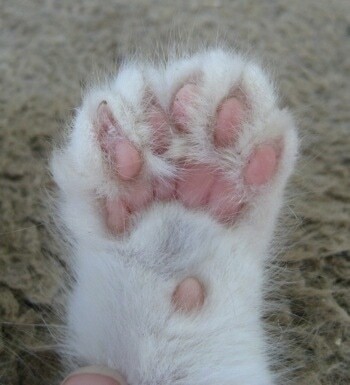 Underside of the front paws showing extra toes of a polydactyl kitten. This kitten was stretching his toes because he was very happy and content. "This is Mittens (Mits), a cat residing at the old Hemingway House in Key West, FL and from a line descending from England. Brandi was also from this line born in Punta Gorda, FL at Fishermen's Village 11/1/2008. 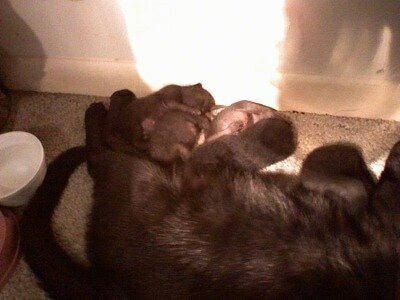 Her children were born 7/28/09 by Tom, a grey polydactyl living in Punta Gorda. They had three female and two males with these characteristics." 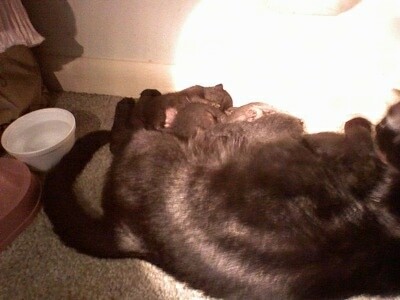 Polydactyl kittens with their mother Brandi. Their father was Tom, a grey polydactyl living in Punta Gorda, Florida. Polydactyl kittens with their mother Brandi. Their father was Tom, a grey polydactyl living in Punta Gorda. 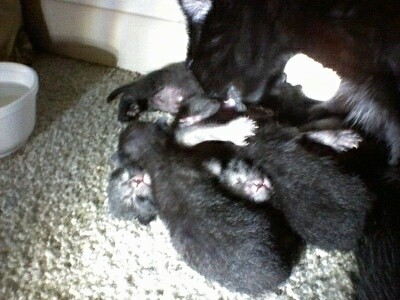 "These kittens were born on March 10th to our polydactyl cat named Booger. 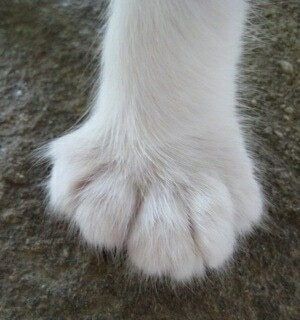 The father is not polydactyl."